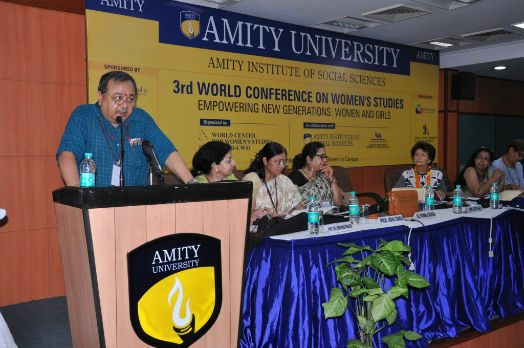 Noida: Amity Institute of Social Sciences (AISS) in collaboration with World Center for Women Studies (World – CWS) and College of Arts & Sciences, University at Buffalo, SUNY, USA started ‘3rd World Conference on Women Studies’ on theme “Empowering New Generation: Women & Girls” at Amity University Uttar Pradesh, Noida Campus. Various pertinent and thematic issues was discussed and deliberated upon during the Conference such as securing girls education, stopping violence against women and promoting dignity of women, increasing women’s decision-making power, promoting women and girls empowerment through Art, opening opportunities in Science and Technology, securing women’s and girl’s health, Rural women-access & control over land and livelihood-challenges & strategies to overcome. Shri Alok Rawat, I.A.S (Retd.) Former Secretary, Government of India, Hon’ble Member, National Commission for Women; Professor Sheila Bunwaree, SSR Chair of African Studies, University of Mauritius, Mauritius; Ms Vandana Aggarwal, IES, Additional Secretary Ministry of Civil Aviation, Govt. of India, New Delhi; Dr. Purnima Chauhan, IAS, Certified ToT for LBSNAA, Mussoorie for mainstreaming gender in governance, Secretary (Administrative Reforms), Government of Himachal Pradesh, Shimla and Prof. Maria Anita Stefanelli, Vice President, World Center for Women Studies, Dipartimento di Lingue, Letterature e Culture Straniere, via del Valco San Paolo, Università Roma Tre, Rome, Italy were present during the occasion. Welcoming the gathering, Prof. Abha Singh, Dean, Faculty of Arts, Humanities, Journalism, communication and Social Sciences stressed that it’s painful to see that after years of struggle, the world is still fighting for gender equality. She raised the concern over the socialization process within the homes and remarked that it is important to have a gender neutral environment at home for gender equality to be possible in society. Addressing the gathering, Shri Alok Rawat, I.A.S (Retd.) Former Secretary, Government of India, Hon’ble Member, National Commission for Women said that women and girls make half of the population but are still fighting for the rights they deserve. He mentioned that women empowerment is a multi dimensional social process to ensure that women have every equal right and many organizations and government agencies are working towards achieving this goal. However, there is still lot that needs to be done. He lamented that it is the lack of implementation of policies, not just in India but across the globe that women are still fighting for equality. Stating measures required for ensuring women empowerment, Mr. Rawat said that inculcating of awareness about gender neutrality amongst youth, enhancing the confidence of women and girls that they can compete in any field at par with men, could ameliorate the condition of women in society. He pointed out that political power is a powerful tool for women empowerment, since, the increased involvement of women in gram panchyats has resulted in better decision making. “Same contribution and involvement is required in 1st & 2nd tier political system.” he opined. Speaking on the occasion, Ms Vandana Aggarwal, IES, Additional Secretary Ministry of Civil Aviation, Govt. 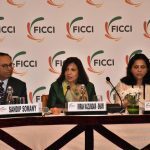 of India highlighted three main trends to be focused upon to achieve the goal of women empowerment. First, implementation of Sustainable Development Goals which now include actionable gender related issues; second, ensuring the economic empowerment of developing countries through active involvement of women in the growth and development of the country and last, devising country specific policies to improve the condition of women, considering the country’s culture, requirements and people.